I don't know how long I'll be able to keep coming up with running mileage puns... :p If you're here for the March template please see the previous post. I set my alarm for 5:55 AM this morning and boy did I have a hard time getting out of bed! Especially with the time change, it was dark! But because I'm such a *dedicated* runner (insert tongue in cheek here), I got myself up and out. Today's 12 mile run with WCRR started at Torrey Pines State Beach and went up to Las Olas Restaurant in Cardiff, then back. 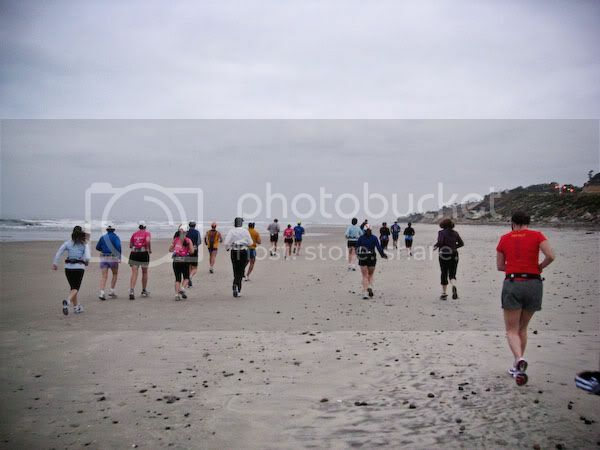 The first two miles were on the packed sand on the beach, and the sun was barely up! Here's my group, the Catalinas, starting out: I guess I'm a weirdo, but I found running on the sand hard, or else it's because it usually takes me two miles to warm up and start to feel good. Either way, I was glad to be back on asphalt after the first two miles. 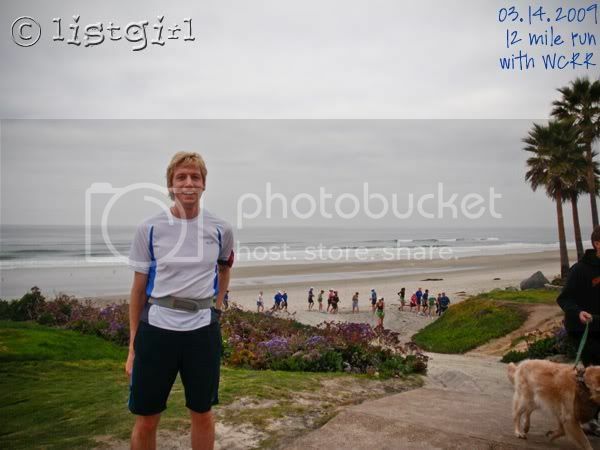 Here's Todd arriving at Jake's Del Mar, after running on the sand: Todd has become quite the budding running photographer. Not only did he take more photos than me today, but his photos turned out better. Here's Todd's group starting out. I love this shot, it reminds me of Charlie's Angels (or insert other similar shows here), where the main characters walk toward the camera lined up, with their hair blowing in the wind. Hee hee. 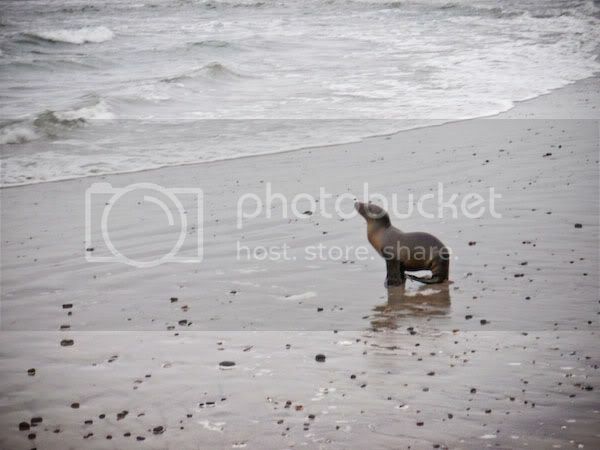 While Todd was running on the beach, he saw a baby seal! The mother was nowhere to be seen. 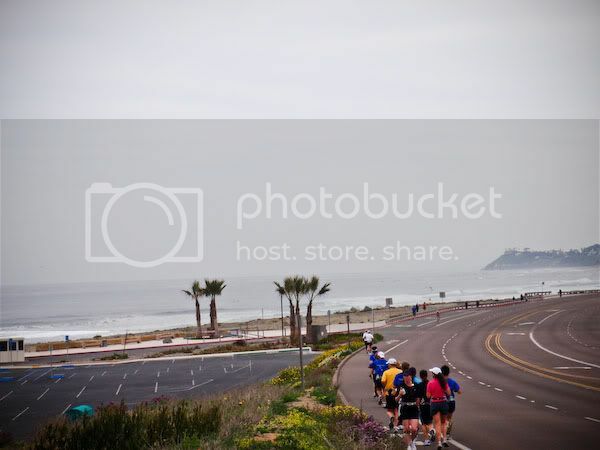 A shot of Todd's group running down the hill from Solana Beach into Cardiff, with the ocean view. Ahhh... beautiful. 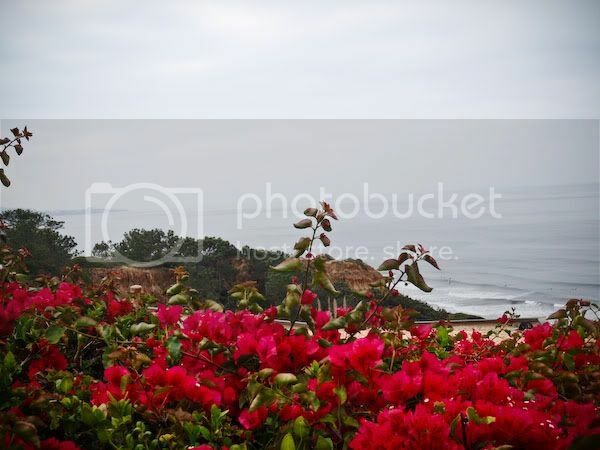 Some beautiful flowers on a cliff by the ocean: I felt pretty good almost the whole 12 miles. I felt the best in the middle miles though. I love that feeling when the runner's high kicks in and you just feel like you can go on forever. But of course that doesn't really happen. By somewhere between 9.5 and 10 miles, I was tired. But luckily, the last mile was all downhill, so I just coasted. Todd caught up with me in the last 100 feet of the run and we finished at the same time. Except... he started half an hour after me, LOL! So he ran 12 miles in 1:48, while I did it in 2:22. Here are my Garmin stats: I ran a negative split (1:12 in the first half, 1:10 in the second half), so I'm pretty happy about that! A shoe shot at the end of the run: After the run we went home and showered and drove two hours to visit my dad and Shelly. Photos and post about that tomorrow. You amaze me with the amount of running that you do. You must be very fit. The shots of the scenery are beautiful. I always get this twinge of jealousy when I look at your pictures. Absolutely GORGEOUS! 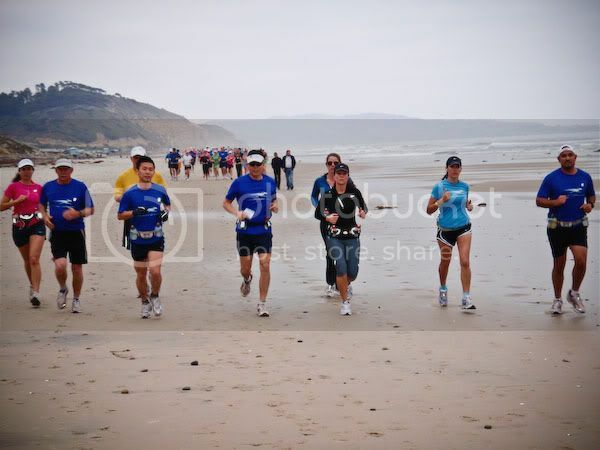 I really admire all the running you guys do! 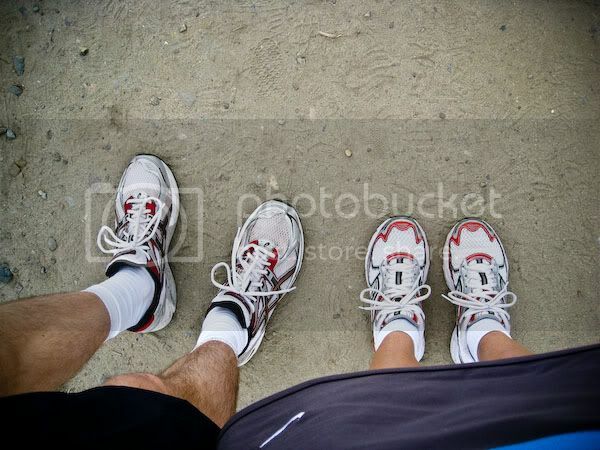 I always love the running pictures, but I especially love the shot of your feet! Your running shots are so great, it is almost as I can hear and scent the ocean and the heavy sand. Cute photo of the baby seal too! Cool shoes! Yours (and Todd's) pictures make me want to move! Maybe I'll go running one day and take a picture of The Lord Family's house...that's probably the most interesting thing I would pass in my five minutes of running... :D Have a great Monday!